The rest of the 2015 NFL season has to be about pride for the San Diego Chargers. With this season pretty much awash, the Chargers have to be at the point of looking towards the future, beginning with next season. And that starts with playing the remainder of their schedule with nothing to lose but their pride, and to a man, playing for themselves. The season started off promising for the Chargers with a 33-28 home win against the Detroit Lions. It’s been rough going ever since. With three of their last four games on the road, that pathway may get a bit rougher. The crazy thing is that with all the talent on the Chargers roster, being 3-9 at this point in the season, was not something you’d expect from this proud franchise. The failure to score a touchdown is also something that is not expected from the Chargers. This is what they do. Starting with Don “Air” Coryell until now, scoring a bunch of points has been a Chargers’ trait. 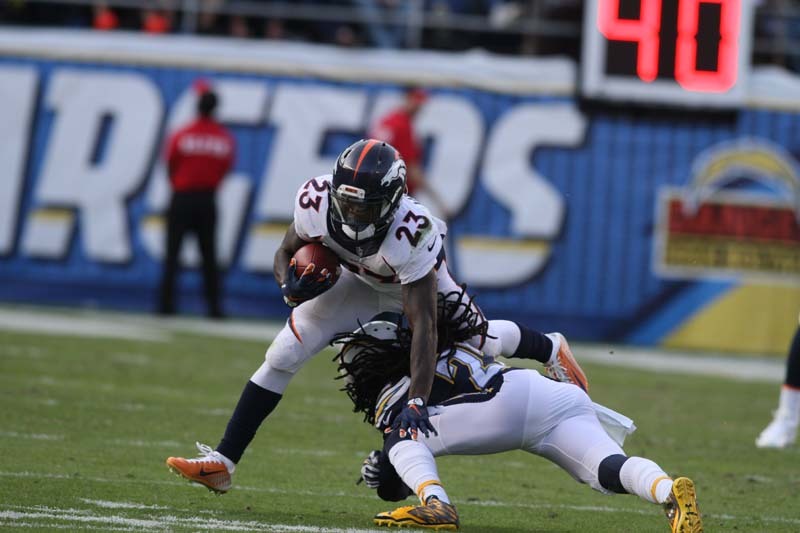 Apparently, the Denver Broncos didn’t give a hoot about that tradition on Sunday, handing the Chargers a 17-3 defeat in front of a Qualcomm Stadium crowd. That’s without Peyton Manning lining up behind center. It is the second time in their last three games that the Chargers could not score more than three points in a contest. What’s happened to the Chargers’ offense lately is somewhat muddied between the rash of injuries that has decimated the team’s offensive line and the tough schedule put in front of San Diego this season. Also getting lost in the shuffle is a running attack that seems to hit a red light every week. Talent and ability will only take a National Football League so far. Every NFL team has their share of skill players that bring about the possibility of regular season success and playoff aspirations. At the start of training camp this year, no doubt the Chargers were brimming in excitement about the promising possibility the 2015 NFL season lay in store for them. The Chargers had just taken one of the top collegiate running backs in the country in Melvin Gordon. All that did was bolster an already potent offense with quarterback Philip Rivers, tight end Antonio Gates and wide receiver Keenan Allen returning back into the fold. Despite being void of a big-time playmaker on defense, the Chargers have some athletes within that unit that can get the job done. Somewhere between the start of the season until now, the train went off of the tracks for the Chargers. A rash injuries taking its toll on the offensive line is a good part of that derailment. And it has carried over as the electric Chargers offense we’ve come to know and expect to explode every game, has suddenly become stale and predictable. That’s because without that consistency from the offensive line, the Chargers have hit a wall. The ground game has turned the offense into a one-dimensional pony. Twelve games into the season, the Chargers still have not hit the century mark in running the football. That’s a recipe that makes it hard to be successful throughout the duration of a season. 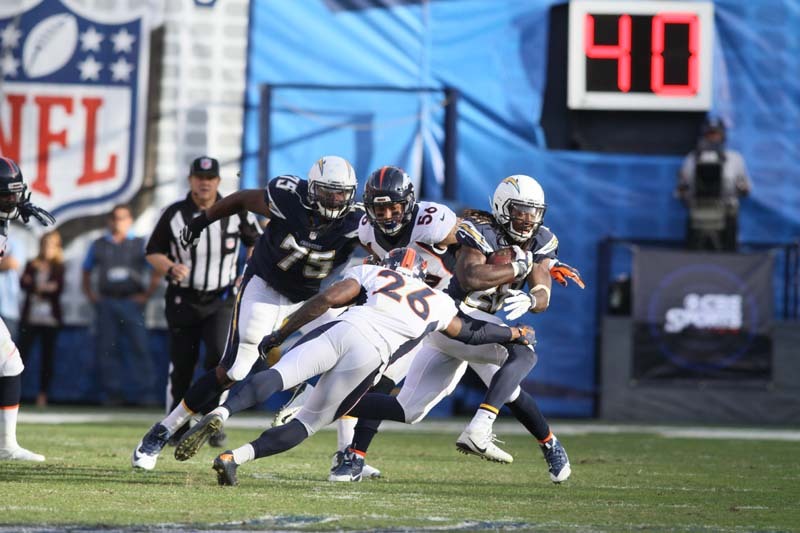 Going up against a top-notch defense like the Broncos, as the Chargers did Sunday at Qualcomm Stadium, only serves to expose that weakness. 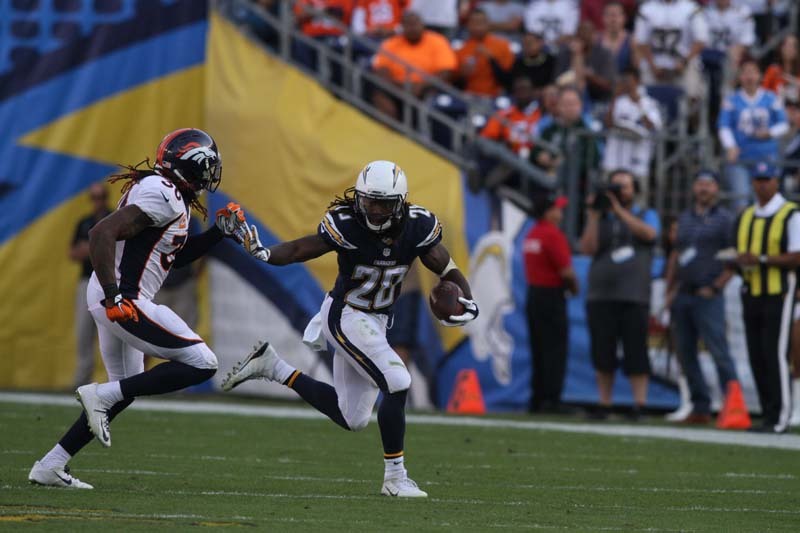 Without a combined 100-yard effort from their plethora of running backs, including Gordon (12 carries, 55 yards), Donald Brown (7 carries, 26 yards), Danny Woodhead (3 carries, 10 yards) and David Johnson (1 carry, 2 yards), the Broncos could focus their attention of stopping Rivers and the Chargers’ aerial show. It worked. So with no real threat on the ground, Rivers probably had his worst afternoon of the season, completing less than 50 percent (18 of 35 for 202 yards, and a bad pick six for a touchdown) of his passes against the AFC West-leading Broncos. There comes a time when a team really need to do some soul-searching. The Chargers are at the point. They need to finish the season strong. Ending the season on a high note is about building and carrying momentum into next season. The problem is that it might be too late for the Chargers to do anything about it moving forward. Every team has pride. It’s time for the Chargers to show it in their next four games.